The life of an Ivy League athlete is unlike any other. During the season, football player Emory Thompson ’18’s day starts around 6 a.m., when he wakes up to lift weights with his team. He spends the bulk of the day in class, in meetings, at office hours, and then from 2 to 4 p.m. he meets with his team and coaches to watch films and discuss strategy. He has 30 minutes to change into his gear and then from 4:30 to 7 p.m. he has practice, showers and gets dinner with his teammates. From 9 p.m. to 1 a.m., he works on homework, and 5 hours later, he wakes up to do it all again. These practice times limit the classes athletes can take, who they can interact with outside of the team and the time they can dedicate to co-curricular activities. Days are a blur of workouts, classes, meetings, meals and homework, each activity gliding into another like a dance choreographed by coaches and academic advisors. Teammates prove to be steady partners in this dance. Emma Winson ’20, who walked on the crew team at the beginning of freshman year and quit sophomore fall, agrees. Both Thompson and Winson said they have close friends outside of their teams — Thompson through small interactions with strangers which blossom into friendships and Winson through her freshman dorm. Drescher is glad she chose to “be a person totally separate from [riding],” though she admits it was difficult, at 18, to learn what she liked to do in her free time. At Dartmouth, she has gotten involved with programs run by the Rockefeller Center, such as the Dartmouth Leadership Attitudes and Behaviors program, First-Year Fellows and the Management and Leadership Development Program, as well as the Dickey Center’s Great Issue Scholars and War and Peace Fellows programs. “I’m glad that I’m not riding here so I can give myself the opportunity to be a student in every sense of that and not just an athlete who goes to school,” Drescher said. Since quitting the women’s crew team, Winson too has had a chance to branch out and redefine who she is. “I met a bunch of people that I never would have met before, and I’ve been able to go out and meet people, and I’ve joined other groups, and now I’m not so focused on choosing classes that have a lighter workload,” she said. Winson feels that athletes do self-segregate in part because of bonding through collectively-endured suffering and in part because of an almost subconscious sense of superiority. Thompson agrees that joining the football team granted him immediate access to a group of friends. “When I came to campus I had a hundred guys that I knew, so I had a place of belonging that a lot of people don’t have” he said. And though he recognizes the divide between athletes and non-athletes, Thompson doesn’t believe that the separation is deliberate, arguing that it is simply a function of athletes’ strict schedules. From tearing through homework in the hours before going to bed, to squinting at readings on the long bus rides to away games, he has certainly learned how to manage his time. In fact, Winson found managing her schoolwork easier when she had 17 hours of practice each week. “You have certain amounts of time during your day in which you have to sit down and get your work done,” she said. In addition Winson believes the tough mindset cultivated by crew translates to the classroom. “You can do anything for 20 minutes: you can do schoolwork for 20 minutes,” she said. Varsity athletes gain a lot — access to resources provided by a network of alumni, a tight social network and an incredible work ethic — but they also lose the opportunity for social and academic experimentation and self-exploration. Furthermore, the insular athletic communities reinforced by intense training and tight schedules limit interactions between athletes and non-athletes. The dedicated varsity athlete, recently retired rower and ex-equestrian all acknowledged this divide. Though none viewed it as inherently bad, none were sure it could be remedied. 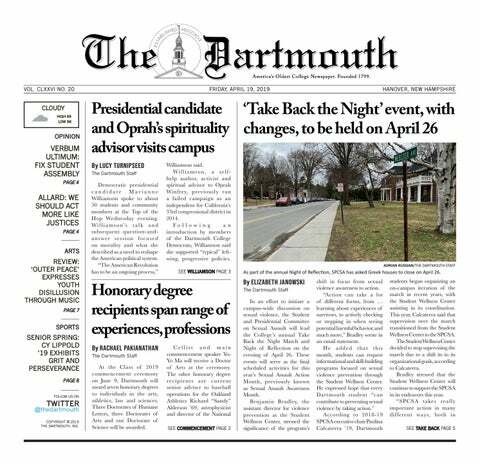 Their attitudes toward the athlete-NARP divide reflects how most Dartmouth students feel about the issue. Athletes and non-athletes at Dartmouth run on parallel paths. We rarely discuss it — aside from half-hearted jokes about “Rocks for Jocks” classes and official unofficial seating assignments at the dining hall. But perhaps it is worth discussing. We are Dartmouth students first, and athletes, NARPs, singers, hikers, actors, engineers, entrepreneurs, artists, recreational joggers, coffee enthusiasts, scientists and corporate sellouts second. “I love the game, but I am an individual, high-thinking young man, and I think that’s more my identity and the essence of who I am as a person,” Thompson said.